Did you watch “The Great Escape” over Christmas? Despite the fact the 1963 prisoner-of-war classic has as much to do with Santa Claus as raging myxomatosis has to do with the Easter Bunny, it’s a regular fixture in the Christmas schedules. This time around it was on Five USA. TV executives could be accused of lazy programming, filling-up several hours with a 50-year old film. But what’s wrong with spending a cold winter’s afternoon settled on the sofa watching an old movie full of big name stars, action, excitement, humour…and that incredible motorcycle leap over the barbed-wire fence at the climax? Whatever your feelings about war films, without doubt it’s a rock solid piece of screen entertainment with a brilliant screenplay and the sure hand of Hollywood veteran John Sturges at the helm. I make a point of watching it every Christmas, not only because I love the film, but because, at a little under four hours screen time, including ad breaks, it’s the perfect length for timing my chicken in the oven. But over the past few years, each viewing has been tinged with sadness as I note which of the stars had passed away since I last watched it. We lost Steve McQueen (“Hilts – The Cooler King”) many years ago, since when Charles Bronson, Donald Pleasence, Nigel Stock, James Coburn, Gordon Jackson and James Donald have all gone. At at the time of writing, only two of the stars are still with us. David McCallum, who went on to fame as llya Kuryakin in “The Man From Uncle” TV series and who currently appears in another hit series “N.C.I.S.” – and singer/actor John Leyton who, at the age of 78 still tours with other veteran pop acts on the Solid Gold Sixties shows. This year has been particularly bad for devotees of the film. We lost James Garner (“Hendley – The Scrounger”) and Sir Richard Attenborough (“Big X“ ) within a month, followed by Angus Lennie (“Ives”). Then just this month, I read the obituary of Tom Adams (“Dai Nimmo”) who went on to be the face of DFS sofas in a series of self-deprecating advertisements – and more recently was the continuity voice for the E4 channel. I often visit the multiplex so I won’t say that new films aren’t as good as old films. Clearly, some right old rubbish was churned out by Hollywood and Pinewood in the past. But all that many modern actors are required to do is react to CGI explosions, lead CGI armies into CGI battles; or take on CGI aliens. When true giants of the screen, like James Garner and Richard Attenborough pass away, their unique qualities as unforgettable actors go with them. So as I watched “The Great Escape” again and noted who was no longer with us, I realised what had happened. Since the film was first released, they’d all escaped…one by one. And they can never be recaptured! One of the things I will never understand as a responsible dog owner is how anyone can leave the house to take their dog for a walk and not have a stock of poo bags in their pocket. I can’t even imagine how people can stand by and watch Fido do his business and then walk away without cleaning it up. All too often you see some poor parent or grandparent having to clean up their little ones shoes or trainers after they have been playing in the park and managed to get Fido’s deposit in the treads of their shoes. With dark mornings and evenings during December many of us are having to walk our four-legged friends without being able to see what is under foot, oh yes, many a time I’ve prayed that was just a slug or a discarded pile of chips that just squidged under my wellie. So here is my plea, please clean up after your dogs, it only takes two minutes to bag it and throw it in the nearest council provided doggy doo bin and, in this weather, it makes a great hand warmer until you find one…. There has been a sudden unwelcome cold snap and most of us have been able to find comfort in well insulated homes with central heating and a nice warm fire. But for too many this winter, this will not be the case. Our towns and cities homeless face a cold, wet and miserable time sleeping outside, cold and often hungry. You may have seen a few of them, but there are many more out there that you don’t see, hanging on just taking one night at a time. Try not to judge until you have walked a mile in their shoes and remember most homeless people were once in the same position as you and I, it could happen to any one of us at any time for many different reasons. I pray that none of you ever have to sleep outside in the cold or go hungry. We can all make a difference; why not make it part of your New Year’s resolutions and don’t just walk by…? It’s Christmas Eve, and I can still remember the thrill of waking up at dawn one Christmas and reaching out to feel the exciting shapes hidden within the pillowcase hanging on the end of the bed. So I looked. And do you know what was there? The motorcycle community often create a negative image in the minds of the public and in the media. Mention the word “bikers” and immediately, big, hairy types covered in tattoos spring to mind. They’re tough as nails, don’t shave for days, never wash their leathers, drink Jack Daniels straight from the bottle, hang around bars and billiard halls and if you look at them the wrong way they’ll gang up on you and give you a right hammering! And the men are even scarier. But those are images of bikers in American films, in which the bikers are all members of Hells Angels chapters and have no visible means of income apart from robbing convenience stores at gunpoint. British bikers aren’t at all like that. They rob Early Learning Centres! Look, if you can’t take a joke, you shouldn’t have left the house dressed like that. Trust me folks, here the biker world is made up of amazing people who pull together and support each other, their communities and many charities. For example the annual “Hoggin’ The Bridge” event, in which 3,000 or more bikers cross the Severn Bridge, raises thousands for charity. Locally, I have seen them raise tremendous amounts of money, donate gifts, toys and Easter eggs to hospitals for children who are unable to be at home to celebrate with their families. They continue to do so much good with very little praise or publicity. So as I have an opportunity each week to say anything I like, practically, I thought I’d speak up on their behalf. Saturday 13th December saw a spectacular demonstration of the biking community coming together. It was the second year of the Bad Santa Bikers Toy Run. Last year’s took place in atrocious weather, but this year it was bright, cold and icy. 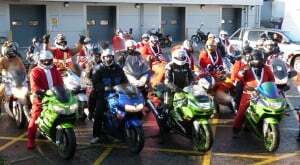 Seventy bikers left M & P Motorcycles, Gorseinon, dressed as Santa and went through Burry Port and Kidwelly and on to Glangwilli Hospital, visiting the chidren’s wards and baby unit. From there, they went to Oakwood Ward at Morriston hospital and then their final stop was Singleton hospital. They distributed 140 gifts between Glangwilli and Morriston, all raised by raffles and donations, £300 of which was generously doubled to £600 by Eddie Beer of Silurian Security Swansea, which will be used for the special care unit at Singleton hospital. 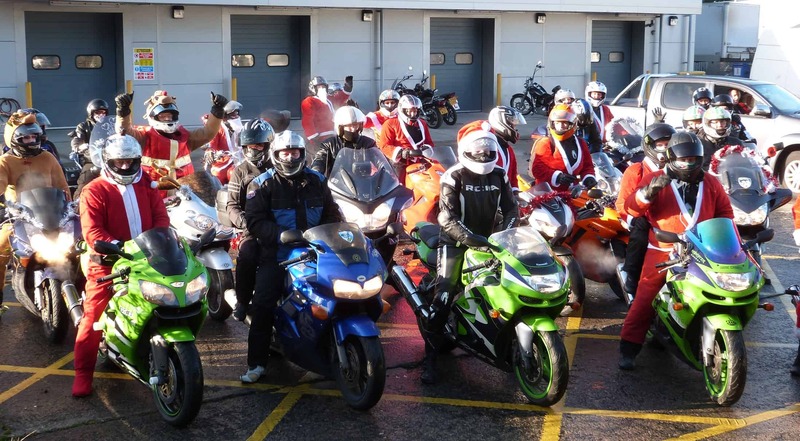 So please raise your Christmas party hats to this brilliant band of big-hearted bikers! Christmas started for me last Friday when I paid a visit to Neath Little Theatre to experience a great play, A Christmas Carol, which was an abridged version from the original by Charles Dickens and directed by Ffion Green. Here I shared the evening with families of all ages, who had come from far and wide ready to experience the magic of Christmas, in one of the smallest and intimate theatres in the area. If you read last week’s page – and if you didn’t you missed out big time, because I revealed Kylie Minogue’s mobile number and Bob Geldof’s PIN number – you’ll remember I briefly mentioned the Nativity. Well as the man who designed the London Eye once remarked “What goes around, comes around.” Because, co-incidentally, just before I started writing this article, I saw something on breakfast TV which astonished me. And no, it wasn’t Lorraine Kelly managing to get through a whole programme without lying to the soap-actress-of-the-day she seems contractually obliged to converse with every morning, “The top secret plotline you’ve been unable to reveal to me during the last six minutes, sounds really grrreat!”, as she laughs and flaps her hands around in the rigorous interviewing style that will surely one day win her the British equivalent of the Pulitzer Prize. What I saw on breakfast TV was even more astonishing. A news item stated that in 2014, only one primary school in three put on a traditional Nativity play, complete with two-foot tall shepherds wearing their Dad’s five-foot long dressing gowns and holding plastic lambs borrowed from a local butchers shop. What added to my astonishment (you’d be astonished at how astonished I get sometimes) was learning that many of the dwindling number of Nativity plays still being put on in schools, don’t feature the angels, the shepherds or three wise men. Instead, they’re replaced by characters, who, according to the modern mantra ‘Children can more easily relate to’ – like superheroes, aliens….and Elvis! Does this explain why so many children have no idea of the real reason we celebrate Christmas? Should we worry that the traditional school nativity play is dying out? Is there anything we can do to halt its demise? And am I asking you far too many questions? A story that, whether you believe it or not, has survived for 2000 years with the same cast of characters, does not benefit from having the shepherds dressed in red & blue Lycra, spinning webs over the manger. Neither does it need a visit from the Three Wise Cybermen. Or the Alien Gabriel. All it would take for children to ‘more easily relate to’ Mary, Joseph, the baby Jesus, the shepherds, the angels and the three wise men is for someone in the school to teach them the story! Because, once you become familiar with characters, whether they inhabit a Bible story or an episode of Peppa Pig, they’re much easier to ‘relate to’. Now I’m going to play the Devil’s Advocate – I’d prefer to play the trombone, but I never learned – and question just how wise the Three Wise Men were. Balthazar, Melchior and Casper brought with them Gold, Frankincense and Myrrh. What made them think yellow metal, white resin and spice were suitable gifts for a new-born baby? If they’d only given it a moment’s thought, they would have brought nappies, baby wipes and a changing mat. Oh…and some Peppa Pig pyjamas! I recently had the pleasure of going to see The Two Tones at Bar Americano in Swansea, SA1. Rhodri and Tom are local lads, who provided us with a fantastic rendition of Crowded House’s ‘Weather with You’ as their opening number. I’m not sure if they wanted me to sing along quite so enthusiastically, but I did! These boy’s vocal harmonies are brilliant. They have an amazing upbeat acoustic vibe which is very uplifting…you just can’t help joining in. It’s very hard to believe it’s just the two of them and their guitars, their voices complement each other so well and the sound they come out with is superb. They have had a very successful summer, which has included recording an EP produced by Jayce Lewis called Fervent Foray, which means trying something new with passion, and they have certainly nailed that. The Two Tones are building up a great following throughout South Wales and with their mentor, Kelly Marie, are sure to keep going from strength to strength. 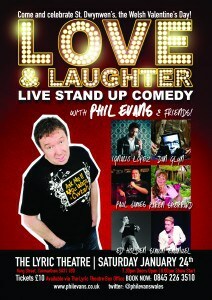 If you get a chance to catch them at a gig near you, go along and take your mates for a great night of entertainment, you won’t be disappointed! A few years ago, street magician and endurance artist (well that’s what he calls himself) David Blaine spent six weeks inside a Perspex box suspended above the ground, next to Tower Bridge, London, as a publicity stunt . He had constant press coverage. Hundreds of people hung around to check if he escaped in the middle of the night to get a bag of chips. His stunning feat placed him in the record books after he placed his smelly feet in a bowl of hot soapy water. Many people remember the stunt. But who remembers what he was publicising? 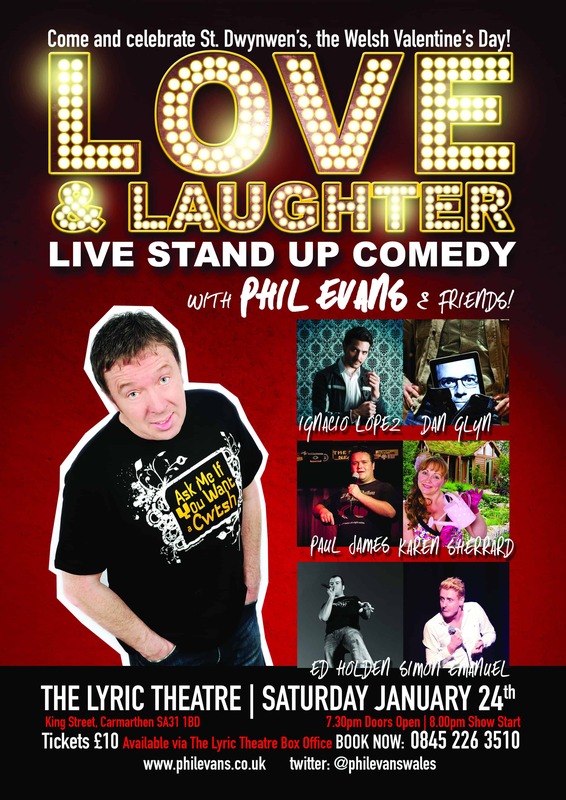 So I hope that the stunt I’ve come up with – channelling the spirit of David Blaine – to publicise my forthcoming show, Love and Laughter at the Lyric theatre, Carmarthen, on 24th January 2015, will create a flurry of interest amongst the local population. At 3.00 a.m. next Sunday morning, from a remote location, I will stop the clock in the clock tower in St. Catherine’s Walk, Carmarthen, using the power of my mind. Some of you may think this impossible. Some of you stopped reading this in the second paragraph. But all of you should be prepared to be amazed.